Construction is poised to begin on a landmark 30,000sqm retail centre in Lake Macquarie set to create more than 600 full-time jobs once complete. 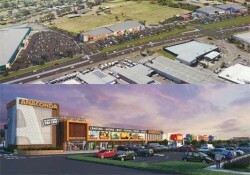 Spotlight Group, which owns the Spotlight and Anaconda retail chains, got the green light in September from the NSW Government to commence work on the first stage of a $90 million centre fronting the Pacific Highway at Bennetts Green. A Bunnings Warehouse and Spotlight and Anaconda stores will anchor the site, with a number of other businesses, including two fast food outlets and a service station, also included in the plans. Mayor of Lake Macquarie, Cr Kay Fraser, said the centre – the largest retail development in the city since the 2010 expansion of Charlestown Square – would provide an enormous boost to the local economy. “This is land that has long been earmarked for development,” Cr Fraser said. Spotlight Group Executive Deputy Chairman Zac Fried said the development would generate more than 825 full-time-equivalent jobs during construction and more than 600 full-time jobs once open. “Bennetts Green is a significant development for the Spotlight Group,” he said. The Stage One approved by the NSW Government’s Hunter & Central Coast Regional Planning Panel consists of the Bunnings Warehouse at the southern end of the site, the central block of retailers including Anaconda and a fast food outlet, and utilities infrastructure works. Spotlight Group will improve footpaths and roads around parts of the site, with new traffic lights installed on the Pacific Highway about 150m south of the Groves Road intersection. The company has lodged development applications with Council for Stages Two and Three. Stage Two includes Spotlight, while Stage Three comprises a service station and second fast food outlet. These are expected to be processed by the end of the year. Lake Macquarie City Council Head of Development and Planning Justin Day said the new development was “an exciting time for Lake Macquarie, and specifically for this part of the city”. “We’re already seeing booming residential development just up the road in Mount Hutton, as well as a $58 million makeover of the Lake Macquarie Fair shopping centre,” Mr Day said. Of the $20.3 million sale price of the land in 2016, $5.58 million was transferred to Council’s Property Investment Reserve. The remaining $14.73 million went into Council’s Community Land Reserve, to be spent on community infrastructure. Spotlight Group said the new centre was expected to open within 14 months.